Well after a shaky start, our tree is finally up. It only took me two days - note to self, probably best not to start getting the tree up near bedtime with an overtired toddler who just wants to take the branches off!! And then both sets of lights died....arghhhhhh!! But we got there, and it looks lovely. Not sure how long the baubles will stay on for though. And I've purposely not hung any chocolate decorations because they wouldn't last five minutes with eagle-eyed Elliot around!! To kick start our festive celebrations we spent some time on Poole Quay this afternoon where they were holding a "Christmas on the Quay" event. There were snowmen, roasted chestnuts, fake snow, panto stars, mulled wine, carol singers, a spiderman marching band (festive eh!) and the big man himself, Father Christmas. After a parade along the Quay front (which me and Elliot missed as we were in the loo, doh! 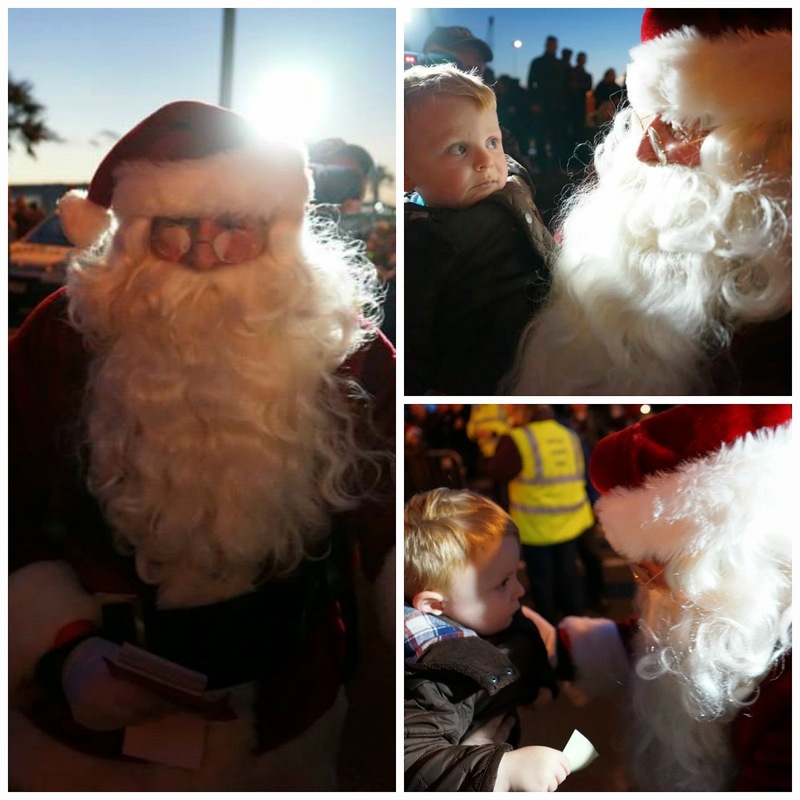 ), Father Christmas made his way along the crowds to meet all the kids and have lots of pics taken. Elliot was more interested in the free sweets that were being handed out but I perched him up on the barrier and waited. Father Christmas came straight over to us and just picked Elliot up for a cuddle!! Elliot was a bit muted (he's got a habit of doing that around famous people hah!) but we managed to get some lovely photos. Father Christmas was one of the best I've seen, a genuinely nice old man who obviously loved children! The atmosphere was lovely down there, very festive just a bit on the chilly side! We managed to see Father Christmas again further along the Quay where he disappeared off into the harbour on an RNLI lifeboat. Back to the North Pole I presume, busy time of year for him! Our last piece of entertainment for the day was the Flotilla of Lights. 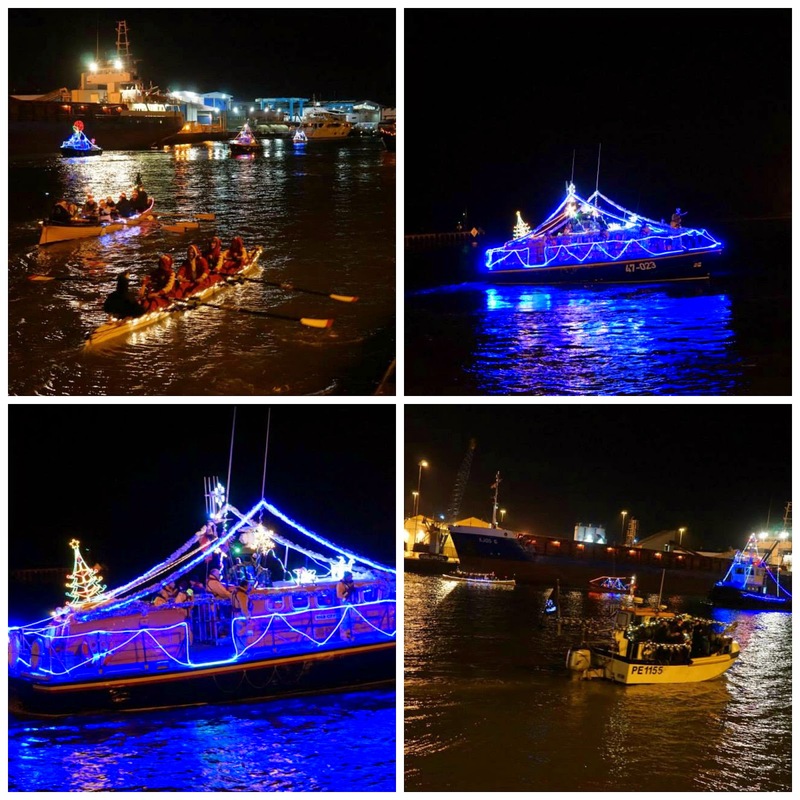 Lots of local boats get decorated in christmas lights and make their way towards the Quay. 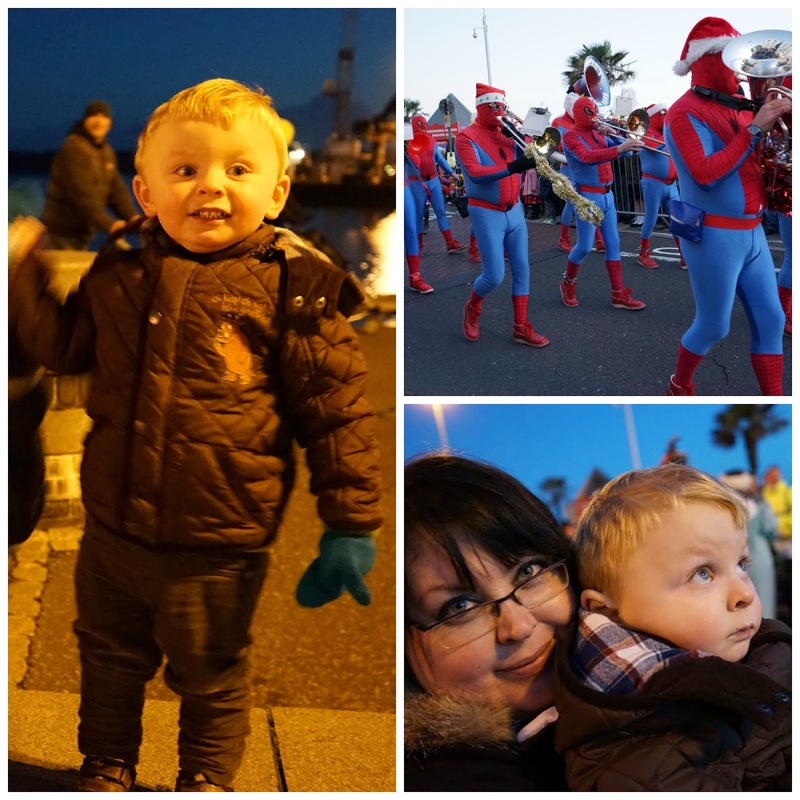 It sounds a bit naff but it's a lovely festive sight seeing all the boats come round the corner and Elliot really enjoyed watching it this year. He especially enjoyed waving to all the fishermen on the boats! This is my favourite time of year and it makes it even more enjoyable having Elliot around. We have lots of fun stuff planned for the next couple of weeks and I am looking forward to getting lots of wear out of our Christmas jumpers!